Oflameron - Original cards game with dice from Russia. Free content. Оригинальная карточная игра с кубиком. Papers and pencil game. Игра на листочке бумаги. Тhis is an old Russian card game forgotten for almost 100 years. The rules and description of the cards are renewed from the documents found in the nineties in the private archives. The game is much more complicated and more interesting than it may be seemed at first. 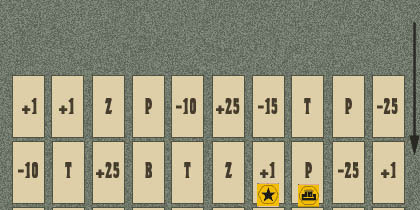 This is the only card game where markers (indexes) and a dice are used. 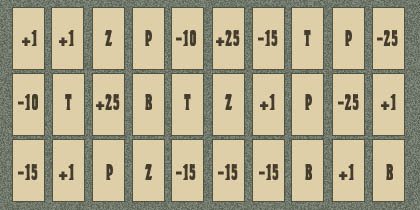 According to the rules of the game there are used “main” cards (70 pieces as a minimum) and a number of “additional” ones. Several players and a few sets of cards are allowed in the game. 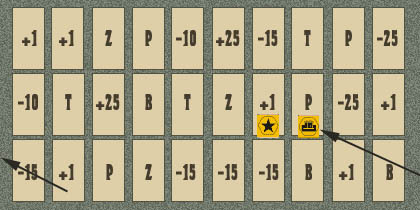 The complete set for the game "Oflameron" one can make independently and free-of-charge, using resources of a web-server. - The description of playing cards. 1. 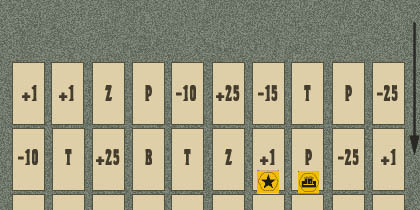 Combine the ready-made cards in a pack and reshuffle. 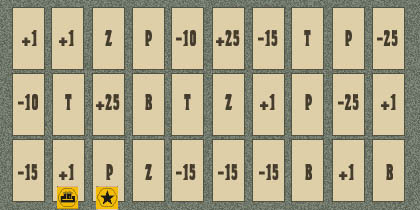 Lay out the cards on the desk as a table - 3 lines for 10 cards each (10 columns for 3 cards each). The left cards are put aside. See JPG images for example. This image size = 27K. Please wait loading. 2. 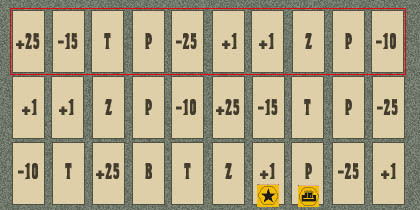 Choose any card in the lower line of the table and put your marker on it. The numerical value specified on this card is added to your account (write it down on a sheet of paper or special notes). Your partners should do the same. See JPG images for example. This image size = 28K. Please wait loading. "+1" - adds 1 point to your partners account. 3. Cards are not moved. One may move only markers. Throw a dice. 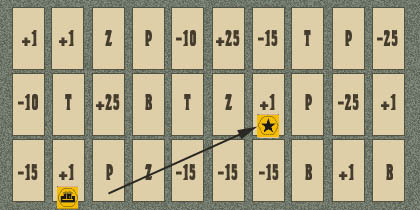 Move your marker only along the lower line of the cards to the right or to the left (for your choice) for a number of cards shown on the dice (in example = 4 points. Move to right). Read the description of the card to which your marker has been moved. Accordingly, increase or reduce your account. If your account became less than zero now, you leave the game. Your partners should fulfill the same actions. 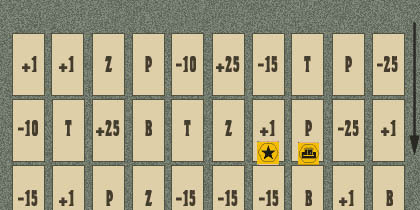 Numbers shown on the dice = 4 points, but move marker to left (for example). 4. Markers are not moved. Cards rows are moved. A vacant upper line should be filled with the cards from the pack. Next step - repeat item 3 and etc. If your account became less than zero or marker moved on cards - leave the game. License Agreement By clicking on the "download" links, downloading archives, or using this game, you are consenting to be bound by this agreement. If You do not agree to all of the terms of this agreement, do not download or use the game "Oflameron".